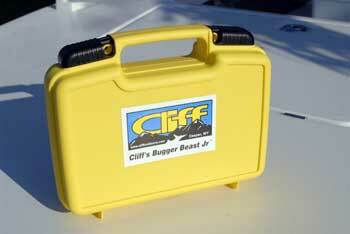 Cliff's Bugger Beast Jr. measures 10" X 6.5" X 2.75" and is made of rigid yellow plastic with dual sliding locks on both sides of the handle. I HAVE A LAMENTABLY large collection of fly boxes. They sit in a closet along with old fly lines, precious and not-so-precious reels, rod socks and fly tying material bags. By a large measure, the boxes take up the most room and are the most unused. But I can’t bring myself to throw them away. In fact I am just as likely to give away a fly rod as I am to see an old cedar box with a corroded bronze plaque go near a trash can, which is surely where it belongs. Even old fly lines end up as sunglass lanyards or garden string, but moldering fly boxes remain. Fly boxes have a way of never becoming truly useless but never seeming to retain that inspirational utility they had when you first stuffed them full of flies. We’re always looking for one that does hold onto its aura. Inside the box, slitted neoprene-like blue material lines the sides. We recently had a chance to field test the Cliff Bugger Beast Jr., and found that it comes closer to our ideal notion of a large-fly box than anything else we’ve seen to date. First, though, a short note on bias: we like simple. We’ve tested, used, and abused many fly boxes and fly stretchers over the years and if there is a single common contributor to fly box mortality it is fanciness. Metal hinges corrode (though some very durable freshwater boxes are of aluminum), magnets lose their mojo, closed-cell foam crumbles. In short, complexity begets fragility. 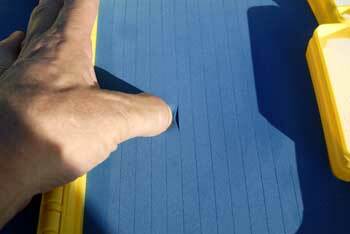 Thumb pressure creates a gap in the slit, allowing for easier insertion of flies. The Cliff Beast Series — which includes the Bugger Beast and Bugger Beast Jr. — is the model of simplicity. The boxes are identical except for size: the Beast is 13.5″ X 9″ X 3″ and the Beast Jr. 10″ X 6.5″ X 2.75″. 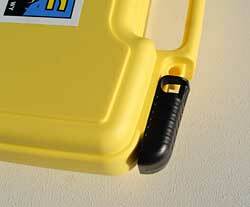 Both boxes are made of rigid yellow plastic with strong dual hinges and oversized slide locks on either side of the handle. (We’re not yet sure whether the slide locks provide only a security option or might work well as locations for attaching the box to a float tube or backpack.) 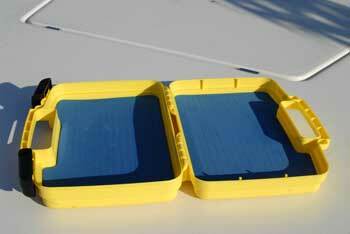 Inside the box, slitted neoprene-like blue material lines the sides. A small overlap in the connecting edges makes the boxes water-resistant but not waterproof. The boxes are very light, but solidly constructed. 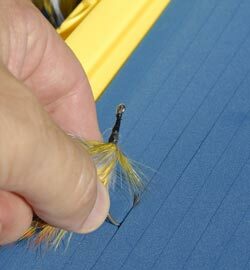 Flies are inserted bend-first into the slits, and then removed by sliding backwards and up. The sliding locks work very well to keep the box closed, even though occasionally we noticed that we had to take care to slide them completely open before we could close the box. Beyond its apparent durability, the feature we liked most in our sample of the Beast Jr. was the slitted fly-holding material. It is about ¼” deep, but we found that inserting the bend of a 3/0 hook less than halfway in secured our flies very well. The insertion is easiest if you apply some slight side- and downward pressure with your thumb to open the slit, but we also find that with a little practice, we could slide the hook bend backwards into place without much effort. To remove a fly, you slide it backwards and up (it will come straight out, but you risk hooking and damaging the material, something we did once or twice at first). We were able to easily fit 18-20 3/0 tarpon flies in one side of the Beast Jr. There is plenty of height in each side of the box, so carrying 40 standard-length 3/0 flies wouldn't be a problem. We were able to easily fit 18-20 3/0 tarpon flies in one side of the Beast Jr. 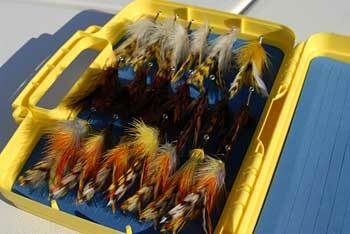 There is plenty of height in each side of the box, so carrying 40 standard-size 3/0 flies wouldn’t be a problem. Obviously, longer flies will limit capacity, but even the Beast Jr.’s 10″ length is long enough for all but the biggest billfish or tandem flies. If you are planning on stowing extra-long, pre-rigged flies with leaders coiled in the box, then the larger Beast is probably your better bet, but we liked the shorter length of the Jr. box, since it would fit comfortably on its end inside a waterproof bag inside a standard skiff storage compartment. We found that while on the water, the Beast Jr. made much more sense than our previously favorite system of keeping flies in plastic sleeves inside a Plano-style plastic box. For one, we didn’t need to keep track of the sleeves (which tend to blow around) once we had removed a fly. Secondly, we could immediately see how many flies of each style we had available. And third, removing the flies was much faster. At $44.95 and $39.95 respectively, the Beast and Beast Jr. are not cheap, but in our opinion they are a great value. Outfitters we spoke to told stories of their guides refusing to let go of the boxes once they had used them, and there is no reason to think that these boxes won’t last through many years of hard use. One thing’s for sure, my Beast Jr. won’t end up in the storage closet anytime soon.